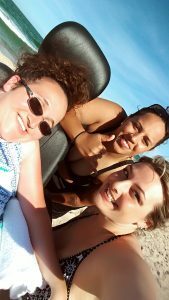 Ocean City Getaway with the Diaphragm Pacemaker - Avery Biomedical Devices, Inc.
Hey everyone! 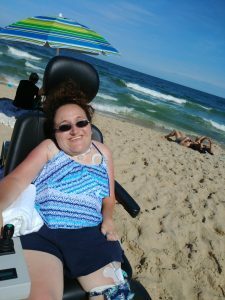 So this week for Nicole’s corner I’m going to talk about my recent get away to Ocean City Maryland. I went for 3 days with two of my friends. We all went for the first time and it was so beautiful and we had a blast. The first night we were there we did some exploring and went to dinner together. Our hotel was on the boardwalk so our room was amazing. As we walk down the boardwalk we went to the arcade, shopped at all the boutiques and even went to the carnival!! Our second day there we decided to go to the beach and do some more exploring. I even got to go on the beach with this awesome beach chair I stumbled upon. We spent about 2 hours there just talking and enjoying the ocean. But after that we went to dinner again. It was all around a great trip and I would definitely go again. 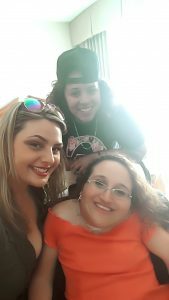 So many people that are in my situation with a spinal cord injury don’t have these opportunities to go on these trips but with my diaphragm pacemaker I have so much more independence without a ventilator holding me back. Talk to you next week!